Luis Vázquez placed his shoes at the memorial in remembrance of his father, Luis Manuel Vázquez, who was found dead in his home two weeks after Hurricane Maria. 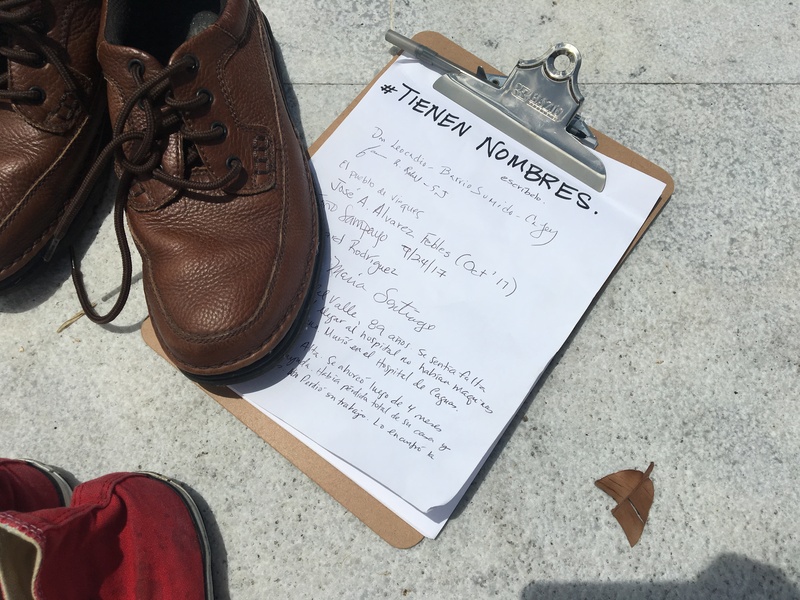 Luis Vázquez walked up to the elegant marble plaza in front of Puerto Rico's capitol building, bent over, and took off his shoes. 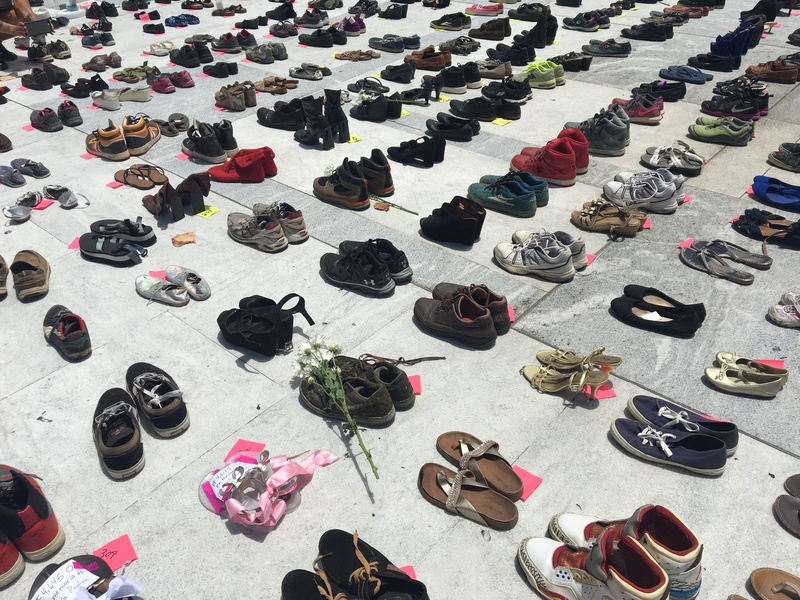 He placed them among more than 400 other pairs that over several hours on Friday began forming a growing memorial to the hundreds, possibly thousands of people believed to have died as a direct or indirect result of Hurricane Maria, but whom Puerto Rico's government has yet to count. Vázquez said his father was one of them. "We thought he wasn't communicating with us because he had no power in his cellphone because there was no electricity," Vázquez said. "So the first week we thought it was normal." The second week, Vázquez's sister made it to their father's house. His decomposing body was in the bathtub. They still don't know what killed Luis Manuel Vázquez, and because they cremated him quickly, they likely never will. "The government doesn't even know how to count the dead," this man's placard reads. "We already threw all of his shoes away," Vázquez said, standing barefoot on the hot marble. "So I put my own, and I'm going to leave them there." 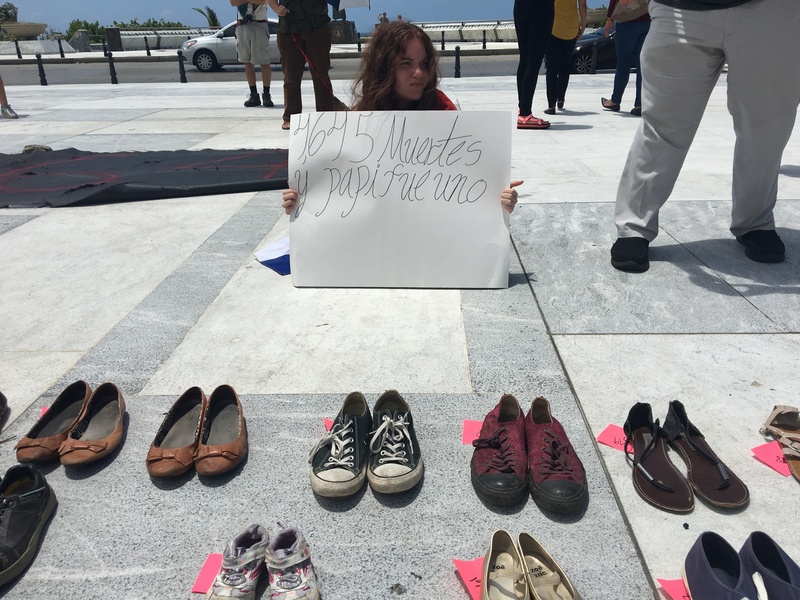 The impromptu display — hundreds of sneakers and dress shoes and high heels and baby slippers — was at once a somber memorial to Puerto Rico's dead and a quiet yet visually arresting protest against what many islanders see as their government's bungled accounting of the loss of life that the hurricane inflicted. 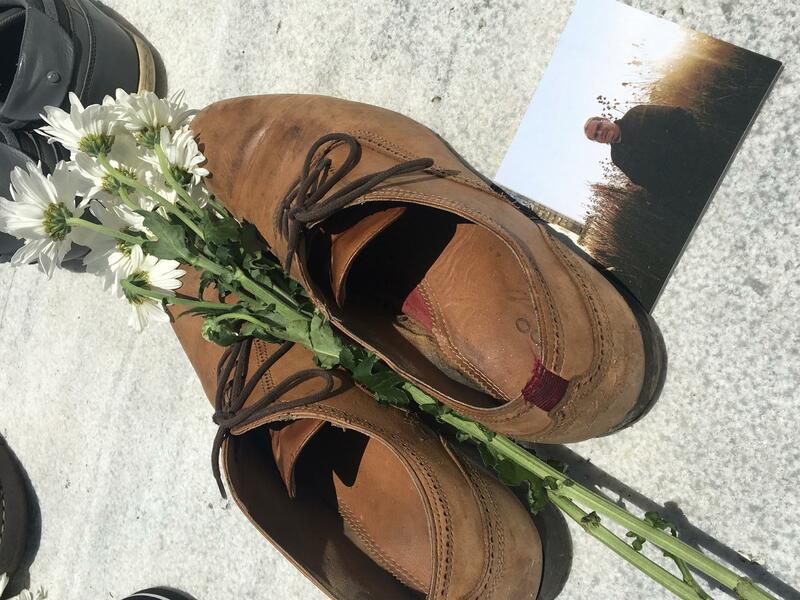 The display began small, but grew to hundreds of pairs of shoes as mourners and protesters arrived. For many in Puerto Rico — and especially for families of hurricane victims — the fact that the government's official tally of the dead remains at 64 more than eight months after the hurricane feels like an insult. They say it's a testament to how dismissive the government has been of their need to have the deaths of their loved ones acknowledged. Those feelings were thrust to the surface again this week after Harvard University researchers released a study that estimated upwards of 4,000 possible hurricane-related deaths in the three months after the storm. The study, based on household surveys and therefore prone to a wide margin of error, pre-empted what is expected to be a more precise study that Puerto Rico's government commissioned, but that has been delayed. A key number in the Harvard study — 4,645 possible dead — has quickly become a symbol: of the local and federal governments' failure to save lives, of the suspicion many have that Gov. 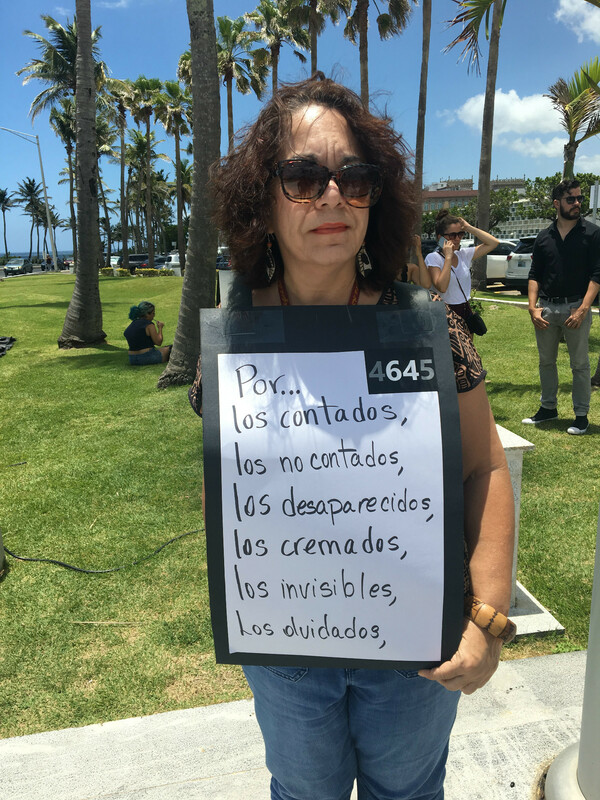 Ricardo Rosselló has tried to suppress the true tally, of the victims who survivors say must not be forgotten or overlooked. Ani Sanchez brought a pair of her old sneakers for the display. She said like many people, she's not under any illusion that 4,645 is a true count. "I don't think that is an exact number," she said, "but at least the conversation started that the number is a lot greater than what the authorities reported. It's not 64." "For the counted, the uncounted, the disappeared, the cremated, the invisible, the forgotten," Virgen Quiñones wrote. "Perhaps the first way they counted was wrong, but these people have to be counted and they have to be acknowledged," Sanchez said. "Because if you were here and you saw your neighbors die because they couldn't go down the stairs, and old people left behind, we have to let them know that they were not forgotten." Others believe the real number is much higher than any of the latest estimates, but doubt they'll ever know the truth. "The governor said he was going to have a transparent government, a government in black and white," said Migdalia Dueño. "What he has is a gray government." 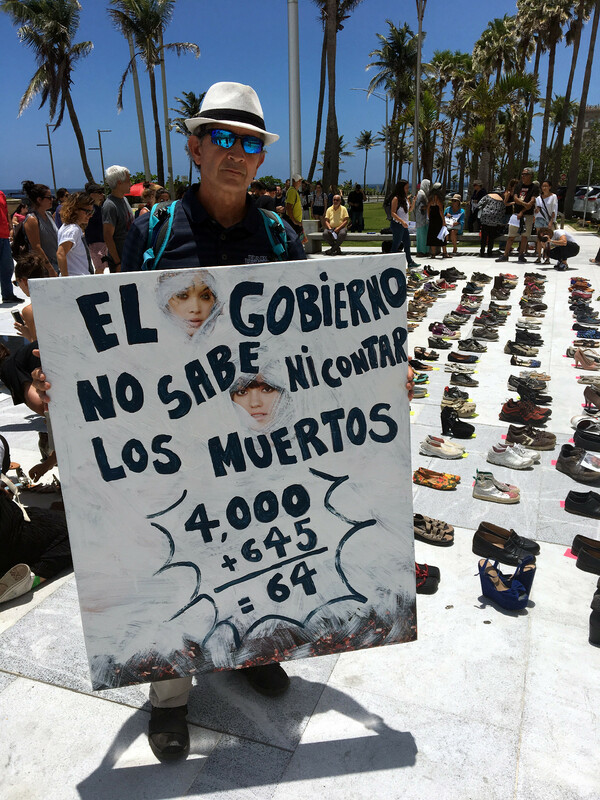 Luis Manuel Vázquez's daughter held a sign that read, "4,645 dead and my daddy was one of them." Indeed, recent comments from Rosselló himself have raised questions about his administration's transparency over the death count. Speaking to CNN on Thursday, Rosselló said "there will be hell to pay" if he found out that officials in his government had withheld data that researchers and journalists have been seeking as they try to arrive at a more conclusive count of the dead. But the government's refusal to release mortality data has been extensively covered in the local press for months. And just last week, Rosselló administration lawyers appeared in a San Juan courtroom to respond to a lawsuit filed by Puerto Rico's Center for Investigative Journalism, which has been seeking mortality data. The government's lawyers said they would release some information eventually, but they pleaded with the judge not to force them to release it just yet.